This homebred 3 year old out of Via Ferrata was sold at Tattersalls Ireland August NH Sale. Having never left home before she took it all in her stride and behaved impeccably. New World, a 6 year old homebred out of Nova Rose (pictured on our homepage as a foal) won the maiden hurdle at Down Royal last week. He is trained by Keith Henry Clarke and was ridden by Robbie Power, congratulations to all connections. 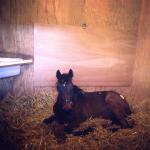 More foals have arrived over the last week. She Storm foaled a filly by Rip Van Winkle. Mystery Lot foaled her first ever colt!! He is by Mount Nelson. Tiriana, one of our foundation mares, foaled a colt by Champs Elysees. She has been a wonderful mare for the yard over the years, but sadly this was her last foal and she will be greatly missed.